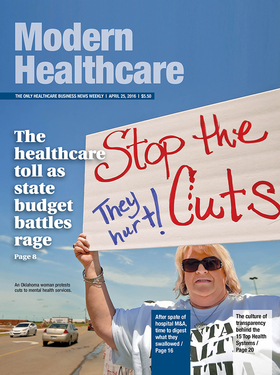 Thank you for the April 25 cover story “Breaking the system,” drawing attention to how state budget battles are preventing numerous citizens from accessing services that are integral to their health and well-being. We've noticed the same trend in instances where healthcare overlaps with community-based human-service organizations, like those we represent at the Alliance for Strong Families and Communities. Together, healthcare and human services often work side by side to foster the human potential available in all people. Yet we've heard from far too many organizations recently that are no longer able to provide crucial services due to budget tug-of-wars among state leaders. Having worked in state government in two states and now as the leader of a national organization, I believe it's the responsibility of our elected officials to find common ground and ensure all people have access to the care, opportunity and supports they need to live to their fullest potential. We cannot let individuals and communities continue to be pawns in this very risky game. President and CEOAlliance for Strong Families and CommunitiesWashington, D.C. Regarding the recent blog post “Hospitals prosper on commercial payers as Medicare margins sink to -9%,” unfortunately, that is not the case for rural hospitals. Average -9% Medicare margins imply that a vast number of hospitals will suffer even greater losses. Rural hospitals rely heavily on Medicare and Medicaid payments. Limited access to commercial insurers and continued CMS reimbursement reductions only serve to worsen the death spiral for rural hospitals, physicians and other providers who work within them, and the patients who rely on them. Regarding the April 18 editorial, “CMS' bold gamble on primary care,” the arguments are well stated. CMS is moving in the right direction. Commercial payers in some markets may need a nudge.